Convera reported its third quarter FY09 results yesterday with revenues of $0.239M for the period ending 10/31/08. 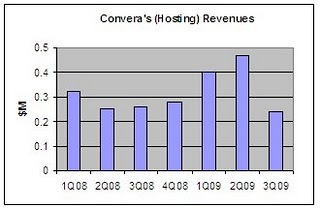 This means Convera’s run-rate (4x the most recent quarter revenues), has now dipped below $1M. Overall, I’d say the burn-the-ships attempt at transition (covered previously here and also again here) from a Federally-focused enterprise search vendor to a hosted ad-sharing-driven vertical search platform is not going well. The decline in revenue is due to a contractual dispute with a significant customer. Revenues from providing services to this significant customer for the three months ended October 31, 2007 included $234,000 of minimum revenues and $270,000 of minimum revenues for the three months ended July 31, 2008. As a consequence of this dispute, we recorded no revenue from the customer during the three months ended October 31, 2008. Viewed differently, even if that customer were happy, revenues would have been $0.519M, a new record, but nevertheless a small number both in an absolute sense and, more importantly, when compared to operating expenses which came to $6.3M for the quarter. The company has burned almost $10M in cash since 1/31/08 (i.e., about $1M/month) and ended the quarter with $26.8M in cash. During the same period, the stock has fallen from about $2.12/share to $0.34/share, an 84% drop. As of this moment, Yahoo!Finance reports a market cap of $19.7M, suggesting an enterprise value of -$7.1M, making Convera worth about 74% of its cash on hand. No comment on Convera finally giving up? They announced last week they're dumping their assets/liabilites on a UK company, distributing whatever cash is left to shareholders and then finally disappearing. Pretty impressive waste of $1.3 billion in shareholders equity.